I have been privileged to ride dirt bikes through some of the greatest decades of this recreation. I first became interested in off road riding just before the age of the Japanese motorcycle and ride on into the renaissance of the European dirt bike. 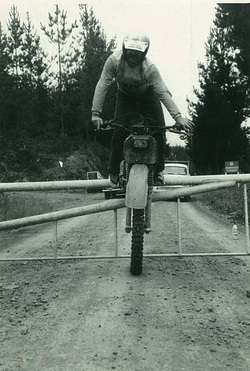 I value the technical skills I learned riding British bikes in the late 1960s and enjoyed the first truly bullet proof dirt bikes of the Japanese manufacturers of the 1970s . Through the eighties and nineties I was continually stimulated by the technical innovations of long travel suspension, disc brakes, liquid cooling, two stroke power valves and the lightweight four stroke revolution. However the most enduring memories all these years have given me are of the people and the fun times shared, because dirt riding can a pretty lonely thing to do on your own. In this section I will assemble an eclectic mix of thoughts, people, opinion, memories and some of the funnier moments. The stories are of course all true, though I confess some do become taller in the re-telling.